Adds Fallout New Vegas-style Damage Threshold. A resource for modders to use. 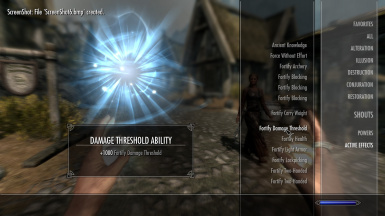 This resource adds the ability to give NPCs a 'Damage Threshold'- a flat value subtracted from all incoming damage, just like in Fallout New Vegas' implementation. This effect can be applied via enchantments on armour or abilities on NPCs, creatures or perks. It's easy! If you only want to apply DT to the player, just create a copy of a0aENCH_DamageThreshold or a0aSPEL_DamageThreshold and alter the magnitude to your taste. Apply them to your items or perks, and there you go! There's also a0aSPEL_DamageThresholdCast. If you want an NPC to be able to benefit from abilities or enchantments that grant DT, you must add the a0aPERK_DamageThreshold perk to them. Then just list Damage Threshold as a prerequisite for your users and no more work is required! Higher damage attacks no longer push targets back further. This had to be disabled or attacks reduced to below 0 damage instead pulled targets forwards. I've been out of the Skyrim scene for so long I have no idea if this will conflict with anything else hijacking AVVariable02.